As pediatric residents moved from one conversation to the next, community physicians shared stories that painted a life-like picture of what the class of 2020 might experience over the next three years and in their future careers as pediatricians. Residents listened intently, learning as much as they could about the residency experience and the world of community practice during these brief conversations. Nine community physicians shared their stories about life inside and outside of the clinic. "The Resident Champion program fills a gap between residency training and the world of the community physicians who care for patients," said Dr. Tommy Wang, director of the Pediatric Residency Program. "Mentors can be great role models and help residents learn what’s going on in the office. This should make residents more sensitive and more aware of the service they need to provide, resulting in better care for patients." 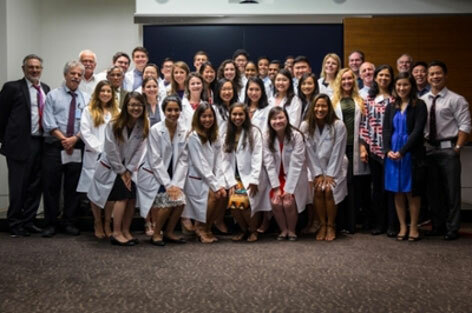 The pediatric residency program provides clinical experience at UC Irvine Medical Center, CHOC Children’s Hospital of Orange County and Miller Children’s Hospital, two large, free-standing children’s hospitals with distinctive areas of clinical excellence and demographically diverse patients. More than 700 medical school graduates applied for 30 positions in the current Class of 2020.